Happy Monday or as I like to call it my Thursday. Remind me next year to take the entire week of Thanksgiving off. Because it may be my Thursday but my two work days are jammed packed. I am usually 99% done with my Christmas shopping by this time, I'm a little behind this year. I'm also making several gifts so that's part of the slow progress. 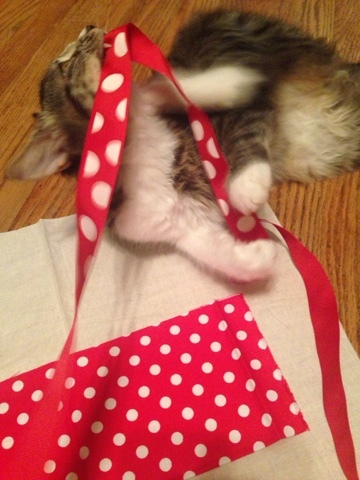 Especially when the cats keep trying to eat the ribbon. Even though I'm behind I'm not tempted to black Friday shop. I have 3 main reasons. I hate getting up early. Crowds of people make me homicidal, and standing in lines annoys the crap out of me. Plain and simple I have no patience for such things. Oh yeah of course I'd rather be curled up under my heated throw than deal with the black Friday mess but I'd also rather do the following. I have never had a root canal, but I hear they are terrible. I'm sure she and I would have a lot to talk about. This goes along with Glee. It makes my ears hurt and makes me want to poke my ear drums out, but I'd still rather do that than go black Friday shopping. Online shopping seems appealing to me. Maybe I will order the rest of my presents while wearing PJ's and drinking hot chocolate.